Featured here are the final moments of Appleton/Green Bay's Channel 32 in its first incarnation as WXGZ-TV.  The station made its on-air premiere on 7 March 1984 as a typical independent station. In October 1986, WXGZ became a charter affiliate of the new Fox Television Network, but because of Fox's limited program offerings during its initial years, Channel 32 was still essentially an indie. By 1991, the station's initial owner, Apleton Midwestern TV, was in deep financial excrement and had to declare bankrupcy in November of that year. Unable to get extended credit to keep the station on or to find a new owner, WXGZ was taken dark after the airing of the above clip on Valentine's Day 1992. The following day, fellow indie WGBA-TV 26 in Green Bay picked up the Fox affiliation (it would switch to NBC in 1995). The video consists of the final eight munutes of a half-hour retrospective program featuring footage of WXGZ's local programming and behind-the-scenes goings-on at the station. In several scenes we see Channel 32's most noted personality Oscor the Clown, who had his own Sunday morning show for several years on Super 32. It is either WXGZ staff announcer Ed Myers or general manager Roy Smith that delivers the farewell before the sign-off message, a still video graphic listing technical stats, transmitter and studio locations that runs for twenty seconds. Then WGBZ-TV "Super 32" goes off into television eternal darkness. Some months after Channel 32 went dark, a new owner was found in the name of Ace TV Inc., assisted by Aries Communications, then owner of WGBA-TV 26, who would operate WXGZ via a local marketing agreement (LMA). The station returned to the air in June 1994 using the WXGZ call letters. The following year the calls were changed to WACY-TV and Channel 32 became affiliated with the old United Paramount Network (UPN). When UPN was merged with The WB Network in mid-2006 to form The CW network, WACY became affilated with the new MyNetworkTV, which remains such to the present day.